John O’Leary is one of the ol’ guys responsible for the British Blues revival in the sixties, we should be grateful to them. John was the co-founder of The Savoy Brown Blues Band and played with other famous Blues people (i.e. Champion Jack Dupree, John Dummer). Now there is this, his second solo album ‘Sins’. 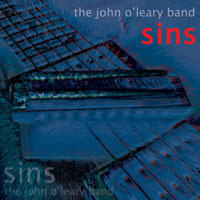 However, he puts it in perspective: this is an album from The John O’Leary Band. And that band is world class. It is also an international band with (German) Joachim Greve (drums) and (Belgian) Dominique Vantomme on the keys. Guitar player Jules Fothergill produced the CD in an excellent way (he also did the graphics of the CD cover but maybe he shouldn’t have done that too!). The John O’Leary Band applies many styles; most remarkable are the jazzy ones with a firm dose of rock (‘Blue Water’, ‘Waiting For You’).